I'm not going to speculate about what will happen to Estate. But this drama will surely play itself out more interestingly than any of us could imagine. After struggling through the long, harsh winter, I decided to pop down to Miami for the Winter Party. It was truly heavenly wearing shorts again, but the trip was somewhat bittersweet. The heterosexualization of South Beach may have begun several years ago, but the change in the past 12 months has been most dramatic. Where was the overwhelming community spirit of past circuit weekends, when thousands of gay men and women literally engulfed the billion-dollar sandbar? In its place tons of rowdy straight folks were blaring hip-hop and rap music or spouting off offensive epithets. The beach has definitely changed, and we were clearly the minority this year. But that didn't mean the individual parties were any less fun. Celebrating Winter Party's 11th year with over $900,000 raised for local gay organizations, the Gay & Lesbian Foundation of South Florida presented more than 20 events starting on March 1. I exercised restraint and only attended the namesake beach party on Sunday afternoon, March 9, with DJs Roland Belmares and Tracy Young; and Sabor Tropical at Crobar with DJ Victor Calderone. Victor turned out one of the best performances of his career Sunday night at Crobar. Incidentally, the Crobar marquee curiously listed New York as one of the venue's hometowns, leading one to wonder if the Manhattan outpost is back on track and will launch soon. Gay Pride, perhaps? Experiencing such an amazing musical journey as the one provided by Victor at Crobar only reminds me just how unfortunate it is that we don't get to hear him more often here in New York. And now that Estate @ Limelight has shut down, who knows when we'll hear him play locally again? The rumor mill shifted into high gear when John Blair sent out an e-mail recently announcing the club's temporary closure. 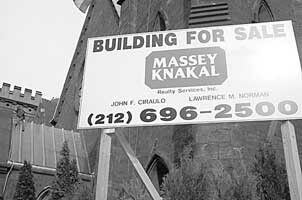 A huge "For Sale" sign mounted out front of the club prompted my editor to opine, "I really don't think that when you're unloading a landmark gothic church that has been a major NYC disco for years, you hang a 'For Sale' sign like some two-bedroom colonial in Levittown from a Century 21 broker. The whole thing sounds bizarre to me." Bizarre indeed. While it is entirely possible that the club, which has only been open on Sundays for the past couple months, is simply caving in to financial difficulties brought on by costly renovations and a crumbling economy, it seems equally as likely that it is some sort of power ploy amongst the club's bickering partners. By the time this issue hits the streets, it is quite likely that tickets for the infamous Saint At Large Black Party at Roseland Ballroom on Saturday, March 22, will have already sold out. One of the largest and most popular gay dance parties in North America, this year's event features DJs Hex Hector, Victor Calderone and Susan Morabito (appearing in that order), and marks the first time that a woman has played this testosterone-fueled frenzy. Check your inhibitions at the door and be prepared to experience one of the most intense tribal gatherings in the world. Explore your dark side at SaintAtLarge.com. In an effort to take advantage of the sole remaining gay mega dance party in New York City (sad, isn't it? ), I stopped by Roxy on Saturday night to hear resident DJ Peter Rauhofer throw down a few records. I was particularly looking forward to hearing his freshly completed remix of Madonna's "American Life," the forthcoming single from her album of the same name. He told me earlier in the day that it was one of the most challenging songs he has ever remixed. In fact, he was a little apprehensive to call it a song at all, as the original is apparently far different from anything we've heard before. There is no hook, per se, and the song spans several disparate genres, including French house, folk guitar and even a rap a la Missy Elliott. Unfortunately, I arrived just after Peter played the record, so I guess I'll have to wait a few more weeks to hear his 11-minute interpretation. Peter is also working on a CD compilation of chill-out/lounge music in conjunction with the Chelsea restaurant Cafeteria called "Hear," and he'll soon embark on a two-month, 12-city U.S. club tour with Tracy Young celebrating the success of Showtime's "Queer As Folk" series. The Babylon Tour kicks off in Miami on March 20, and will include live performances by artists like Kristine W along the way. Peter will also be mixing the next "QAF" CD. Visit Sho.com/Queer, PeterRauhofer.com and DJTracyYoung.com for more information. Grammy winner Jody Watley is looking for a new hit, and she might very well have found it with "Whenever," the first single from her new album "Midnight Lounge" (Shinbone Alley). The double-pack maxi-single commercial release, including remixes by Junior Vasquez, is forthcoming. In the meantime, you can pick up the album in stores, or enter to win one of five promotional copies by sending an e-mail to contest@mattunleashed.com (courtesy of Martha @ Fly-Life Music). Winners will be chosen randomly on Friday, April 4. Jody will also be performing live at Joe's Pub on Friday, April 11 at 9:30p.m. Check out MissJodyWatley.com for updates.